Your footwear should match your work. The tough men's work boots and shoes will protect you in your every working condition. It doesn't matter if it's raining or flaming, we have steel toe boots, shoes and many other types of work boots for both men or women. 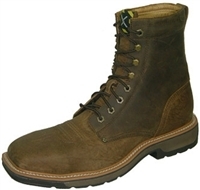 We have low prices for top quality boots from Ariat, Justin and Twisted X. Even if it's not work you can slip on a pair of stylish men or women's work boots for any occasion. If it's safety, durability and affordable safety clothing you want, come to Professional Safety Supply. Keeping your little piggies safe with these steel toe work boots from Twisted X. One of the best makers of safety footwear whether you're just running around or burning rods in the welding industry, these work boots keep you comfortable and safe. Features a leather foot and fun stitched lime upper. It also contanis a Safety Comfort SD footbed that is antibacterial and moisture wicking. The XSD Insole is a flexible one-piece insole with integrated composite sandwich shank for maximum stability. OK, here's what you've been waiting for; Twisted X has done it. What many said couldn't be done; A wide square, light weight steel toe boot that doesn't make your feet look like Herman Muster's. The toe profile is low and the boots look like cowboy boots. Just as our original cowboy work boots, our light weight cowboy work boots have the same cool features except the weight is about 15% less. These have become an industry leader and we thank you for that. Born on the ranch, ready for anything. Perfect for welding, railroad work and other high heat environments. WorkHog is the best boot for climbing/ladder work and provides great support and cushioning for all occupations. The Wide Square Toe Tall sports a 13 inch shaft with six-row Western stitch pattern, deep scallop and reinforced finger holes for easy pull-on.